Tuesday, October 9 | 1:00 p.m. ATTENTION: All young professionals (YPs), managers of YPs and friends of YPs! It's a first in the 13-year history of Young Professionals Network (YPN) South Bend. 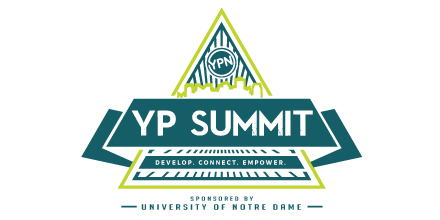 YPs ages 21-39 are encouraged to attend the inaugural YP Summit, a half-day professional development conference, presented by YPN South Bend in partnership with the University of Notre Dame. Created by YPs for YPs, the October 9 conference will deliver important content to build one's personal and professional portfolio. Gain tools to help you in your job while connecting with other YPs. The Chamber encourages employers in the region to make the YP Summit available for their young talent. Those YPs employed by a Chamber member business will receive a discount on registration by applying the promo code CSYP18 when signing up. YPN South Bend, in partnership with presenting sponsor the University of Notre Dame, is thrilled to announce the addition of Notre Dame Women's Basketball Head Coach Muffet McGraw and Associate Head Coach Niele Ivey to our keynote lineup for the inaugural YP Summit! They'll be joining previously announced Jason Lippert, CEO, Lippert Components, on our keynote lineup. But that's not all! In addition to the two keynotes, we'll present four breakout sessions throughout the afternoon, for which you'll be able to attend two. After all of the professional development you'll receive, you'll be able to connect with other YPs at the wrap-up networking reception, sponsored by Centier Bank. Your registration includes parking at the Century Center, two keynotes, two breakouts, networking reception and one drink ticket, snacks during the day and appetizers at the reception. Hurry and register today before we sell out! 120 Dr. Martin Luther King, Jr. Pkwy.